Hello Everyone! I hope everyone had a great long weekend. I thought I would share some custom modifications to commercial wheelchair seating products. Often we use custom fabrication techniques to meet a client’s complex postural needs, however, it’s important to remember that commercial products can also be modified in a variety of different ways. Modifying equipment that a client already has can be a very cost effective option. Often times, simply making custom additions or changes with regards to set-up can make a huge difference to a client’s posture, comfort and function. The client that I was working with here has C5 Quadriplegia. He has a power wheelchair and commercial seating products but was feeling like he was collapsing forward through his trunk. This was affecting comfort, physical appearance and his ability to work on his computer. Another issue was that if his trunk fell forwards onto his lap when traveling in the community he wasn’t able to reach his tilt switch on his joystick. This was a concern as he needs to tilt back to re-position himself back upright independently. 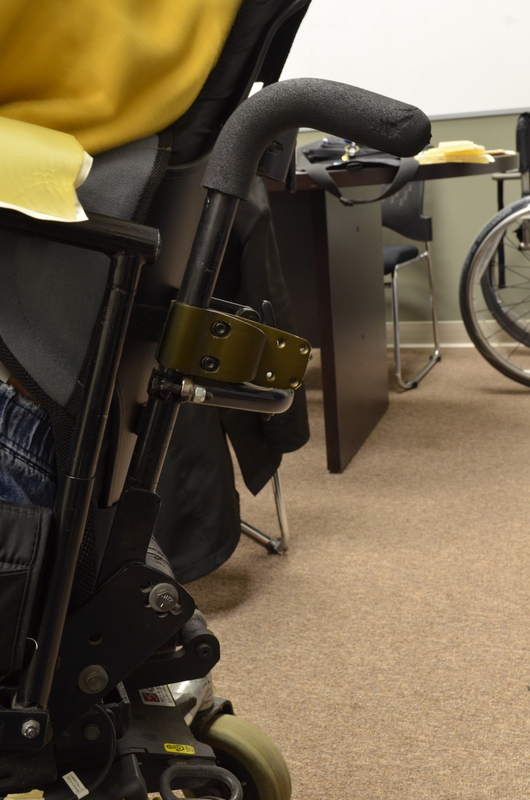 After completing a seating assessment and review, the following changes were made to his system: The custom modifications here, were completed by Wahbi at Advanced Mobility Products Ltd. The photos below are of a Jay 3 Backrest. Foam (I love foam!) was added to the lumbar region to improve contouring and support. In addition, the top of the backrest was heated and flared back to allow for more clearance for the client’s scapulae and upper back. Once the top of the backrest was flared, the headrest mount was spaced out to clear the top of the backrest. The client’s armrest were also raised by 3 inches. This required custom armrest post extensions that were fabricated by Advanced Mobility. This allowed the client to support himself more upright by propping with his elbows. An Action gel overlay was added for pressure relief at his elbows. These were secured with velcro and could be removed by the client so that he can use them at his computer desk. The gel was originally covered, however, this made them too slippery. In order to address the issue with access to the tilt function, a buddy button was added to the bottom of his seat pan. When this client fell forwards onto his trunk, he was easily able to reach under the seat pan to access the tilt switch. This made a significant difference for him as he would no longer need to wait for help if he ever lost positioning when traveling in the community independently. This client also uses the back canes to hook his arms onto for support. The back canes here were cut, angled out and re-welded to allow the client hook his arms around the back with more ease. Thanks again to Advanced Mobility for the great custom modifications. I hope you enjoyed reading about this case today. I would love to hear about your creative modifications to the seating systems you are working on. Please feel free to comment or post about anything interesting you have done out there. I would love to hear about them! Thanks again for checking in.